Welcome to our Fairy Baby Bedding section! Does your nursery need a little splash of color and style? Does your little princess dream of castles and ponies and magical worlds? 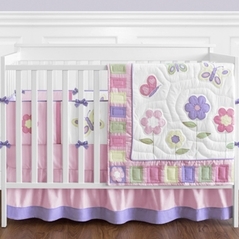 Our fairy crib bedding sets are designed to capture the essence of a young girls imagination. Fairy crib bedding has always been popular through the decades and we have all the favorite fairy tale inspired crib bedding sets to match your favorite story book fantasies. From the beautiful girls Fairy Tale Crib Bedding sets to our star baby bedding sets, Beyond Bedding is your one-stop-store for all your bedding needs with leading brands such as Sweet Jojo Designs. Our fairy crib baby bedding sets come in soft pink tones that will make your little princess feel like the bell of the ball. Don't forget the accessories to go along with your fairy tale baby bedding set! Please check out our other great bedding selections, like our solid baby bedding which is perfect for your girl or boy, and the exquisitely charming lace baby bedding, an ideal choice for your little girls bedding.